1.1. It will be an added bonus if the frontage has real water such as facing a swimming pool in a condo/EC. 1.2. If no real water, the next best choice is substantial clear-space also at it's frontage. 1.3. Often if a development has SW1 facing stacks/units. Equally often the same block may also have units facing NE1. 1.4. For me, often, if I were to purchase a unit, definitely: what attracts me (FIRST) is a unit with the double auspicious #9's (in 2024 to 2043)! 1.6. 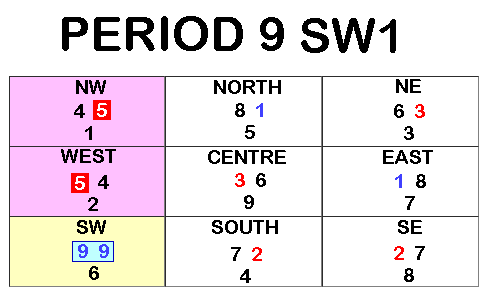 NE1 is a flip of SW1, for this reason, a SW1 unit is preferred over a NE1 unit. The three major considerations in a home: Main Door or Frontage, the Kitchen & Bedroom. 2.2. Often for this facing, the either the Living Room or Master Bedroom is at West or South. 2.3. If one is a West Group person, then better if the bedroom is located at West. For an East Group, it is preferred for the bedroom to be at South. 2.4. Wait! Unfortunately at West sector there is a nasty #5 = misfortune sickness. While at South a #2 = sickness. With a #2 + #7 combination, the #2 is lessen. And easy to cure as compared to the West. 2.5. If Para 2.4. is also considered; for this reason, a West group person may be "forced" to consider the Master Bedroom at South. 2.6. Thus, this is how one should look at the whole picture before "jumping the gun!". 3.1. If possible, avoid a bedroom, here. Good if this is the Master Toilet, Air-con ledge or missing corner. 3.2. Between a bedroom, here or an open space such as the living room or dining, preference is an open space within this sector. Not a confined bedroom. A household shelter or Bath/WC is equally good, here. 4.1. Ideally, there should not be clear space at the centre-point of the home. 4.2. Good if this is the passageway leading towards the bedrooms or in-front of the household shelter or toilet door. 4.3. But less than ideal if the stove or a sink or WC is here. 5.1. #1 = Coming Prosperity. Under Strategic Planning, this is like 5 to 10 year luck towards the future. 5.2. Both bedrooms have an #1 each. If so, good if this is a bedroom or study or open space. 5.3. Since this is not the frontage, no choice if it is the rest of the other areas in a home.